I know you have your To Do List too, so I wanted to know them. I think this is fun so I am starting this tag. Have fun !!!. Let me know if you are done already, ok.? Can you shop till you drop? Hmm that would be an awesome experience if i will be given lotsa lotsa money to spend for a day. Shopping ..shopping.. woman's favorite thing to do, am i right? I once experience goin to the mall in the morning and going home at night already bec. I have been shopping and shopping at the malls, not just one mall but about 3 .. can you do that? That is what they keep on saying to me with regards to digital photography. I have just started liking this new hobby of mine last year eversince i got my point and shoot camera from my uncle who gave it as a gift. I like the thought of taking pictures lots of them actually and see them over adn over again. When i was still in highschool and college i love taking photos using film camera and now i have upgraded my self and bought myself a new canon rebel xti that i never thought I will have. It's kidna expensive but to think that i will not buy any film anymore makes it a good buy. i am practicing shots, trying different angles and compositions. My bro is a photo hobbyists too so he can teach me anytime, Right now i need to learn more. 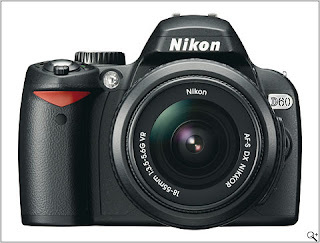 Nikon's new DSLR model is already out in the market and it's NIKON D60. I already own Canon rebel Xti and I just wish I also have one a Nikon one. A New DSLR for me? I went out this morning for a walk i the park eventhough it was gloomy bec. it rained last night. I carried my DSLR hoping to take pictures of anything i see. Indeed there are lots of things to photography there like the birds/ducks swimming in the lake.The flowers are also amazing to take. I was amazed by the little bee in a grass so i came up close to it and took some photos. Many people are walking everyday in the park and while they are doing so, I was so engaged in practicing my photography. I was talking to my customer this morning after he rents one of our computers here at my net cafe and he asked me to print his e-ticket. I asked him where did he get his ticket and he told me online. He said that it is very convenient to purchase his tickets bec. he can choose and compare prices at different online ticket sellers. Aside from that he said that he can quickly go inside the airport w/o much hassle of long lines.